Baldwin's Reserve portfolio of distinctive handlesets, leversets and deadbolts open the door to a world flowing with imagination. 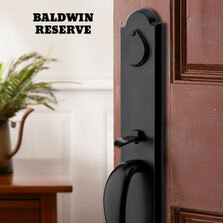 You'll find the quality, peace of mind, and beauty you expect from Baldwin in every lock. True to Baldwin's tradition of quality and craftsmanship, each Baldwin lock is meticulously crafted of the finest materials and with the utmost attention to detail. The Reserve portfolio is for people who want more. They’re looking for more ways to express themselves with the distinctive look of Baldwin and find value in a company with more years of experience and a bona fide commitment to greater quality. 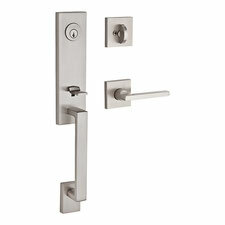 Come visit us at Upper Village Paint & Wallpaper (1162 Eglinton Ave W) to see our selection of Baldwin Reserve Hardware. And it’s all ready to ship in just 5-7 days. Reserve is the best of both worlds: accessibility and artful appeal. Make a lasting impression with Reserve. Available in many different styles. Solid forged brass construction. 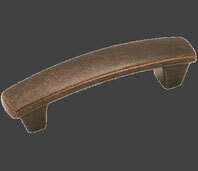 Levers and Roses can be customized with other interior Reserve style knob, lever, or rose. 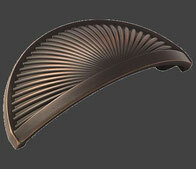 Available in 4 finishes: Satin Nickel, Venetian Bronze, Dark Bronze and Polished Chrome. Solid brass deadbolt latch with hardened steel roll pin for additional strength and security. Baldwin 5-pin C-Keyway standard. SmartKey Re-Key Technology optional. 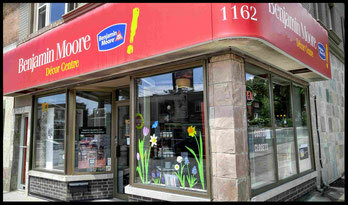 Come visit us at Upper Village Paint & Wallpaper (1162 Eglinton Ave W) to see our selection of Baldwin Handlesets. Since 1929, Amerock® Hardware has set out to offer decorative hardware solutions that inspire, coordinate and help express personal style throughout the home. Amerock offers a complete line of decorative and functional cabinet hardware, bath hardware, hook and rail and wall plates. Amerock’s award-winning decorative and functional hardware solutions have built the company’s reputation for chic design accessories that inspire homeowners to express their personal style. Available in a variety of finishes and styles, Amerock offers high quality designs at affordable prices. Contact Upper Village Paint & Wallpaper by phone (647-352-6119), email or in store (1162 Eglinton Ave W) to learn more and purchase Amerock products. From rustic to modern-day casual to sophisticated beauty, Amerock Collections offer a variety of designs, making on-trend, quality hardware affordable. Go here. Visit Amerock to see their inspired collection of sophisticated finishes. Go here. See Amerock's fusion of art and function with global flair, expressed with hand-crafted styling in unique, eclectic finishes. Go here. Come visit us at Upper Village Paint & Wallpaper (1162 Eglinton Ave W) to see our selection of Baldwin and Amerock Hardware.